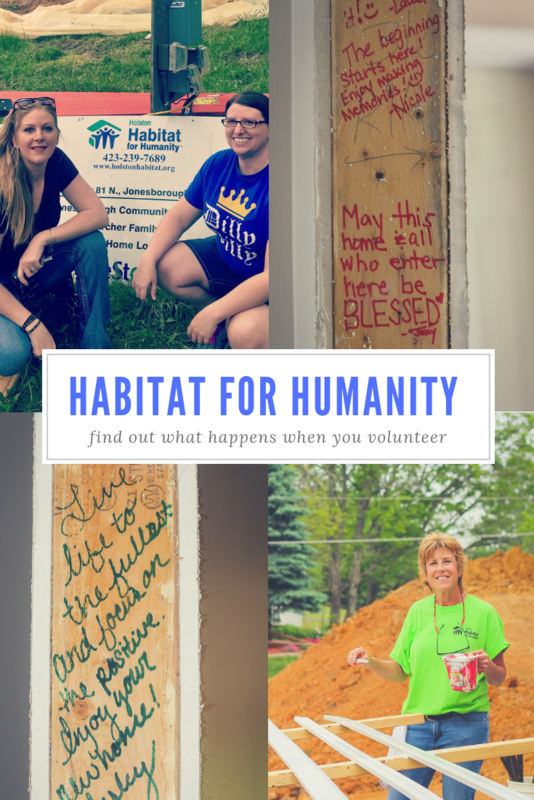 Have you ever thought about volunteering with Habitat For Humanity? T and I really love working with this group. It is one of those volunteer opportunities where you can’t help but help yourself while also helping others. Everyone can benefit by working with this amazing organization. You just need a heartbeat. See, you learn important life skills from other people who don’t care if you are brand new and clueless towards the task at hand. Whatever it may be. The other volunteers will patiently teach you. They will never knock your efforts. Instead, they will simply show you what they have learned. In the end, you can work that hammer, you can paint with no drips, you can run that drill like a pro. They won’t fuss about how many nails you bent while learning how to build a wall frame. They will laugh with you while they work beside you but they won’t laugh at you. 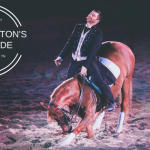 It’s fun and a great way to learn! And best of all, when you head out at the end of the day, there is a family one day closer to coming home. 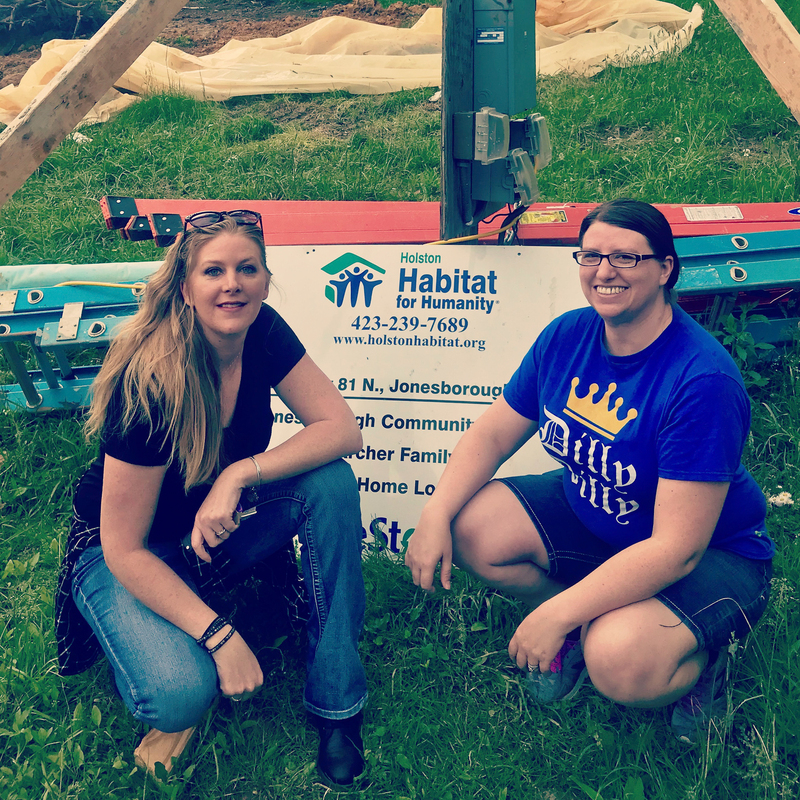 Almost everyone is familiar with Habitat For Humanity but just in case you haven’t been properly introduced, let me share the mission statement of our local chapter with you. 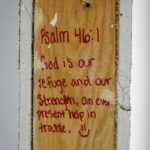 Holston Habitat for Humanity is part of a global, non-profit housing organization operated on Christian principles that seek to put God’s love into action by building homes, communities, and hope. 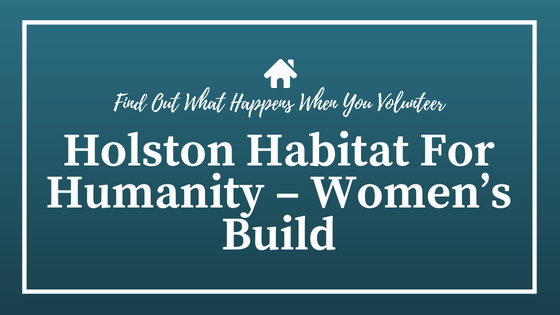 Holston Habitat for Humanity seeks to share the love of Christ by creating partnerships with communities, families, and volunteers to improve the quality of life for families in need by providing simple, affordable, and decent housing and opportunities for home ownership. All volunteers are welcome. You don’t have to be in perfect shape. There isn’t an age cut off at forty. T is fourteen and gets a lot done at a build. But he learned how to run the saw from a man in his sixties who was also getting so much done. 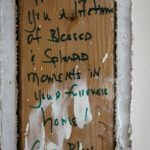 No matter what you feel like you can’t do, Habitat for Humanity needs you and they will find something that you can do. And then they will teach you how to do it well! 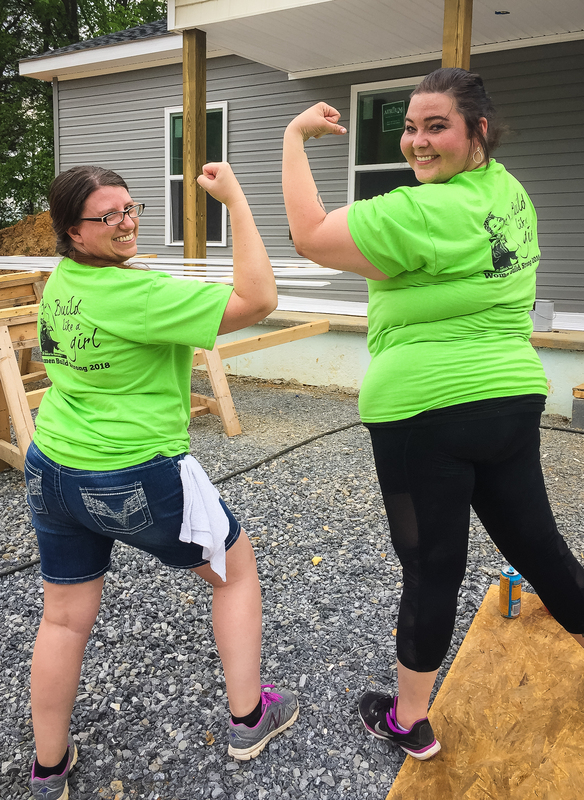 My latest volunteer opportunity with Holston Habitat for Humanity was the Women’s Build and I was really excited to do this one with my sister, Allison! The Women’s Build is a great opportunity to get out there with your Mom, your sisters, your best friends, and even your grandmother! This is the perfect opportunity to be with the girls enjoying time well spent helping out your community. If you don’t think you can find the time, you can. Shifts are only four hours long. 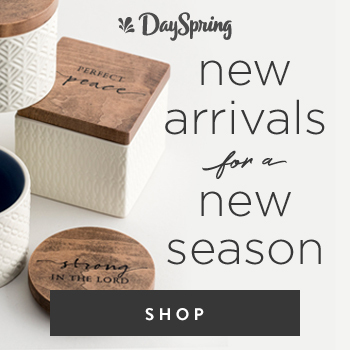 They are offered during the mornings and afternoons. You can volunteer on weekdays or weekends. Also, you may check in with your place of business. Many businesses will actually pay you to spend a certain number of hours a year volunteering for your community! My sister, Allison’s company – Wyndham Smoky Mountains– offers eight Wish Hours to its employees where they can volunteer and still get paid as though they were at work! I can’t think of a single good reason why anyone wouldn’t take advantage of that! Also, if you have a student applying for TN Promise (a scholarship that provides two years of tuition-free attendance at a community or technical college in Tennessee) Holston Habitat for Humanity does count toward the community service requirements for that program. 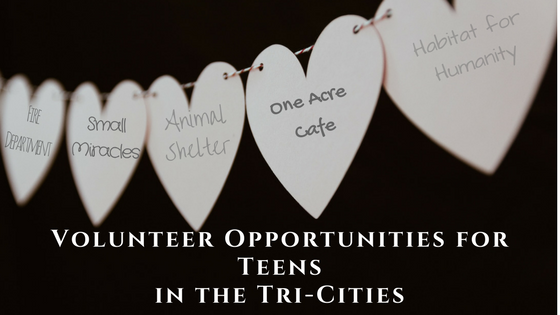 If you only have a little bit of time you can always volunteer at the Johnson City or Kingsport Re-Stores to find a very flexible schedule that meets whatever window of opportunity you have open. 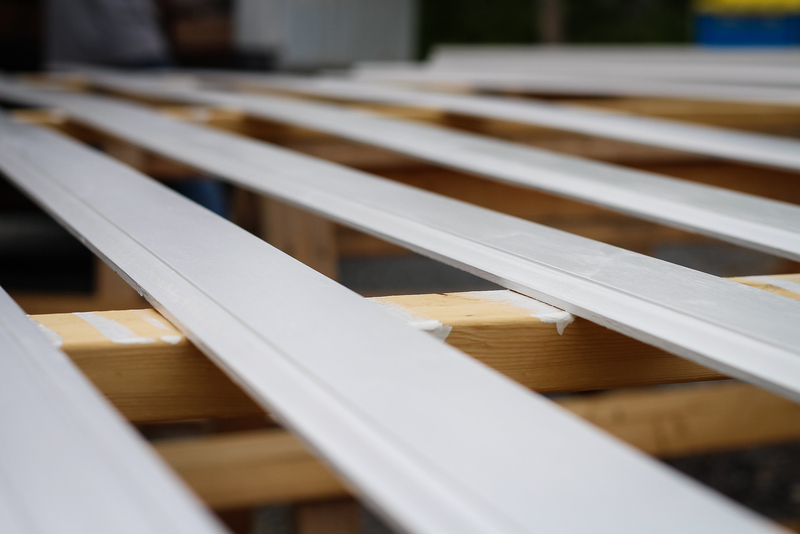 Habitat for Humanity ReStores are nonprofit home improvement stores and donation centers that sell building materials, appliances, new and gently used furniture, and home accessories at a fraction of the retail price. To find out more – click here for Kingsport and click here for Johnson City info. The obvious answer is this, to help out someone who needs you. But there is so much more to volunteering. Volunteering is like a reciprocal relationship, every bit you give comes back to you. Ten fold. It’s awesome. 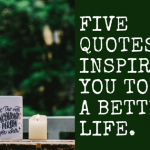 I wrote about some of the best reasons to volunteer in my post Five Things To Do Today To Make Life Better Tomorrow. But here is a breakdown in a nutshell. Expect to be embraced. 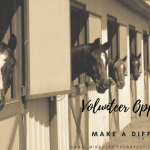 The other volunteers have been where you are and are ready to give you guidance and kindness. Everyone is excited to get to work and it’s contagious. Prepare to catch that. Prepare to meet new friends, learn a new skill, gain some confidence, feel good, and get things done. Don’t worry you will be thrown at something you don’t know how to do and be left alone. You won’t. Don’t worry that you won’t fit in. You’re a part of the same beautiful mission and that’s all it takes to be a fully embraced member of the team. Don’t worry about what you can’t do and be prepared to reduce that list significantly the more you volunteer. Every time you show up you will find another opportunity to learn. Habitat for Humanity works through the entire process of home building. You may start building walls, then find yourself painting them, then find yourself doing landscaping, and on and on and on. You won’t get bored. (From left to right) Nickie, Susan, and Sharon working hard to get that trim painted before the rain falls. I invited some of the volunteers to say a few words to you, the future volunteer. 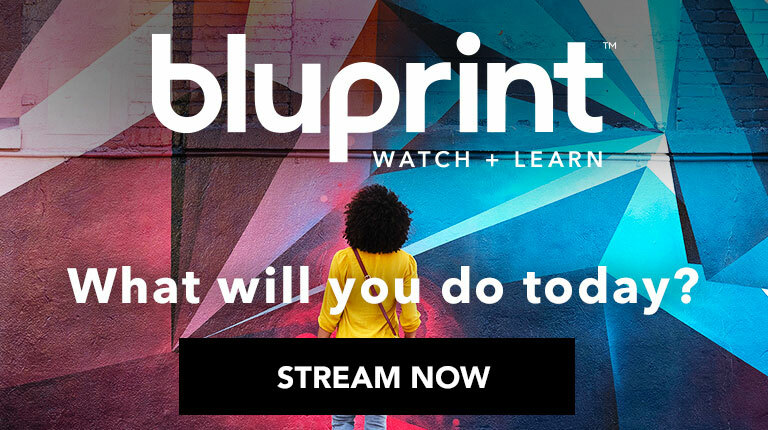 I wanted to give you a chance to see that we are just real everyday people doing what we can to see a family reach their dream of homeownership. None of us are carpenters, or painters, or have ever hung a cabinet. 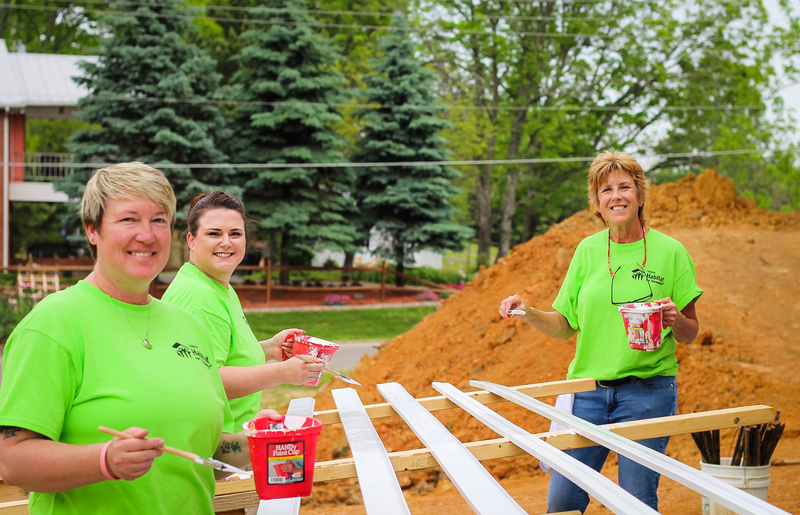 We have Sharon, a retired teacher, and Susan and Nickie from Western and Southern Life that can best talk insurance, retirement, and investment but can also paint some trim like nobodies business. We had Allison and Ensley that work to make your perfect vacation goals a reality with Wyndham Smoky Mountains. The site supervisor Misty is also a student! 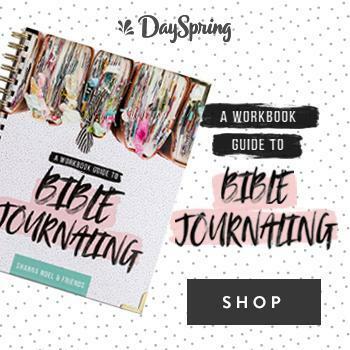 And then me, a homeschool Mom and blogger! 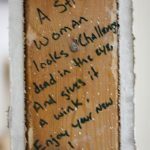 Question One: What inspired you to participate in this year’s Women’s Build? 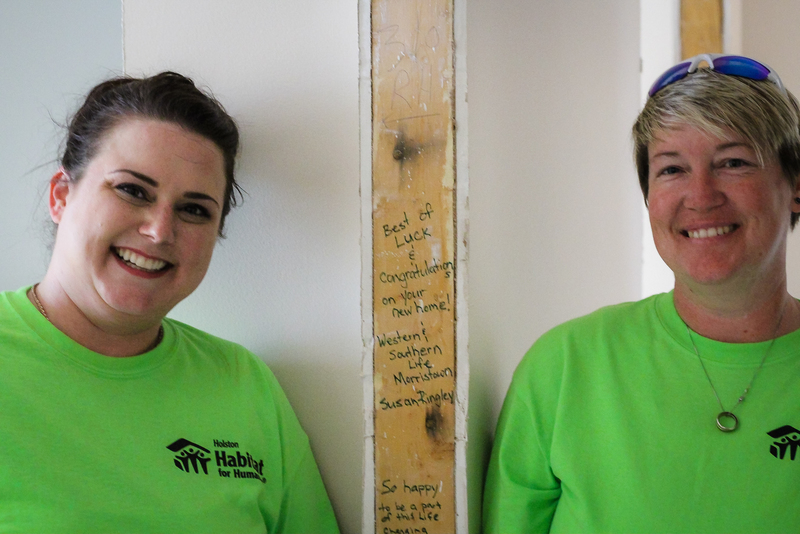 Susan and Nickie: We volunteer in the community at least once a month, but we had never done the Habitat for Humanity before. I guess what made us want to commit is that we felt more comfortable doing this type of event for the first time with other women. Allison: My amazing sister Gwen, who inspires me every day to be a better person. And my constant urge to prove woman as strong and capable of any challenge as a man. And you know, to give someone a forever home. Ensley: I loved the idea of women getting to learn something new that they may not have had a chance to do! Question Two: Do you have any advice for others considering volunteering with Habitat for Humanity? Susan and Nickie: After doing the event yesterday we enjoyed it so much we have reached out to our local Hamblen County chapter and are going to start to volunteering on a monthly basis. Allison: Wear sneakers and prepare to sweat. Have a nice bottle of wine waiting beside the bathtub when you get home, and make sure there’s room for your heart to grow as it fills with love for the people you work with and pride in a job well done. 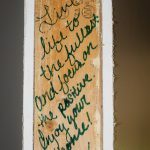 Ensley: No advice other than just do it! It’s extremely rewarding. Question Three: Volunteering can have a powerful impact on us. It has been proven that time spent volunteering can help reduce stress and anxiety and improve our overall sense of well being. New friendships are also a common reward for volunteering. How would you say that volunteering effects you personally? 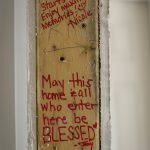 Susan and Nickie: After seeing the hardships that some people can fall, and seeing how the community can come together for the benefit of others is amazing. It makes you remember how lucky we really have it. 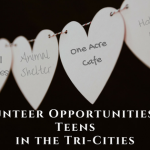 Allison: Volunteering gives me the warm fuzzies, and maybe karmically negates a few of the terrible things I call the ‘tourons’ on a daily basis. But seriously, it helps me see people in a new light, find a renewed appreciation for what I have, and helps me grow as an individual working for a better society. Ensley: Volunteering makes me feel accomplished and gives me a sense of community to get to help others. Allison and Ensley from Wyndham Smoky Mountains taking advantage of those Wish Hours to make the wish of home ownership come true. I know. I know. It makes you love them, doesn’t it? And just think, a group of people are out there ready to welcome you and teach you and open a door of opportunity so that you can change someone’s life for the better! Check in with your local group and give it a shot. Commit to just one little shift. I know you will be glad you did and who knows, you will likely make new friends, learn a new skill, and feel awesome for showing up! 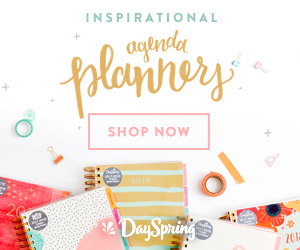 So I am going to end this post now because I know you can’t wait to sign up right this second! I won’t hold you up! Go on you, you beautiful life changer, you selfless go-getter, you world changing – light shining beauty of a soul! Let’s be the change we want to see in this world! I’m Ready! Where Do I Sign Up For Habitat For Humanity? 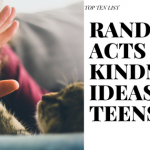 You May Also Like This Post From Geez, Gwen!